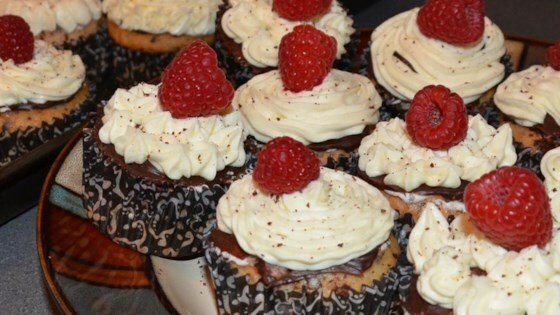 "These cupcakes are a little labor-intensive, but the end product is definitely worth the effort! Even though they don't have a liqueur incorporated with the cake, I call them zuccotto cupcakes because of the whipped cream filling and ganache topping. I made them for my own wedding, and have had to give out the recipe as well as make them for others' special events many times since!" If toasted hazelnuts aren't available at your local grocery or health food store, simply roast raw hazelnuts in a 350 degree F oven (175 degrees C) until the skins crack, 5 to 6 minutes. Remove skins by rubbing vigorously in a clean kitchen towel. You can use fresh raspberries instead of frozen. If you're using frozen raspberries, don't thaw them first: thawed raspberries will fall apart and weep into the whipped cream mixture. You may also use all bittersweet or semisweet chocolate instead of both types.